This is my favorite quick donation quilt. Just a yard of a novelty print and two coordinating fabrics from stash and it always looks so cute! I get questions about how I trim these Quick Strippie quilts to keep the sides even when I’m piecing them. My goal is to trim them without losing a lot of the width. Hopefully this makes sense. First, you’re working with 3 different fabrics and cutting them all width of fabric … From selvage to selvage. I DO NOT remove the selvages. I start with sewing my two narrower strips together and trim them even — because fabrics widths vary, one most likely will be will be shorter than the other. Once all of these sections are sewn and trimmed, I sew each of wider novelty fabric strips to one of the smaller strip sets and trim even. I then finish assembling the top. Please note that your widest strip may be different than what I show in my drawing – just trim even with the shortest strip. If you trim each round, by the time you sew the sections together, they will be fairly even. The top still has selvages on both sides but the sides are fairly even at this point. I layer and quilt the top now and once I’m done, I lay out the quilt on the floor and trim the sides just barely inside the widest selvage on both sides. I use the lines on my ruler and seams of the quilt to keep it square as I move up the sides of the quilt. And here are more Strippies! So many fun novelty fabrics and they all work up SO cute! I can hardly wait to make this pattern. I love a quilt that looks nice and can be put together quickly. I am just finishing up my third strippie. I love this quilt! The first one was a twin for my disabled vet uncle made out of Marine fabric. The next two were baby quilts.Can’t wait to try one of your other quilts. Merci beaucoup pour ce modèle d’ouvrage, il nous met un peu de soleil dans le coeur, merci. I will try this, I am new and this looks like fun. Will make great Baby Quilts. What a great idea. I’m still a novice quilter and I love finding quilts within my skill level that look so rich. Thank you for sharing. I make a lot of charity quilts, I also love scrappy quilts. I could see this in 5 different 6.5″ WOF, with the tone on tone and accent to tie them all together too. This pattern’s a keeper I think. Hi, Mary. Quilts For Kids Bakersfield has also fell in love with this pattern! So easy to put together three fabrics that complement each other and the quilts are stunning! Thanks for making it available. Still amazed at how something so simple can look so good! My heart felt thank you for this pattern. I have been searching for an easy donation quilt pattern. One that was easy and I would proud to give any child. I, too, want to thank you for sharing this strippie quilt pattern. It is really great for making up something quickly but makes a nice gift or charity quilt. And they are great for practicing free motion machine quilting..thanks again. Something sew simple that’s sew cute! I just love this quilt layout. The cows and the sheep, never in a million years would I buy that fabric. But when it’s put together like this, it makes the perfect medium. Now I’ll be going to the fabric store specifically looking for fabrics like that. Can’t wait to find some landscape fabrics. Just found this pattern from the 9 super cool quilty things on the internet at Stitch This. I love the simplicity of this quilt. I love how it playfully shows off a fun fabric. I will remember this. Hope to make one soon. I’m working up tons of charity quilts lately. I used the same pattern and made 3 quilts for my nieces step-children. 2 boys and 1 girl. The girl’s had flowers and the boys had sports balls and then used colors from the main fabric for the other strips. I used the flip and sew method. Less quilting that way. Very interesting. Quick and easy. I own a small quilt shop in Shiner, TX. We have been looking for ideas for a beginner quilt class for adults. This is perfect!!!! They can learn several things and have a finished quilt in only a few classes. Thanks so much for sharing!!!! Mary, A friend asked me to make memory lap quilts using her moms formal dresses. Most appear to be polyester, chiffon, satin etc. These are decades old. Have any suggestions on using the dress fabric? I am at a loss on quilt patterns using these type of fabrics. Help! I have used the Quick Strippie Pattern to make a quilt. I want to send a picture to you. How can I do that? Thank you for generously sharing your amazing patterns. Thanks for the Strippie pattern. We’re using it to make a queen-sized quilt for a grandson. The quilt looks quite “mod” and should be a neat surprise when he arrives home in Feb. We also use it to make charity quilts for hospitals. Great quilt and easy. Glad you shared. Have wanted something attractive when finished yet easy with lots of free motion quilting room. Thanks. Will make many for grands and greats and charity. Love the ease and attractive of design. Appreciate your sharing. I’ve enjoyed making several strip quilts for donations (42 x 64). 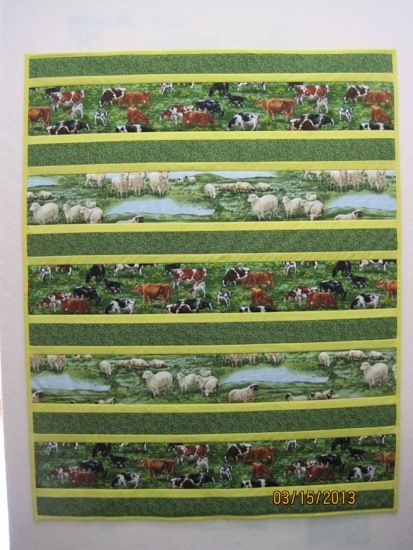 I sew 17 strips using four 8″ focus strips: sports themes, ocean & lighthouse, safari. Since I do not quilt, I simply use the cotton strip pattern for the front, and then a fleece back (blues & greens). I sew the front to the back using the “stitch in the ditch” on the strips. Thanks! Thank you for such a quick yet pretty quilt pattern. I make a lot of children and baby quilts for charity and this works great. Most of the fabric I use is donated and this lends itself to that. Can use several focus fabrics as long as they fit a theme. This is an awesome pattern!! Thanks so much!! This is a wonderful pattern, I’m going to start making these for our local shelter. I can get more made in a shorter time, thanks so very much! Thank you so very much for the quilt directions. It is such a nice quilt too! These are absolutely wonderful! Thank you for sharing them. I have made some that were similar but I like your versions much more. Love your website. What a great pattern; thank you so much Mary. I love this pattern, Mary. Thanks for posting. Always looking for quick but nice looking patterns for charity quilts. 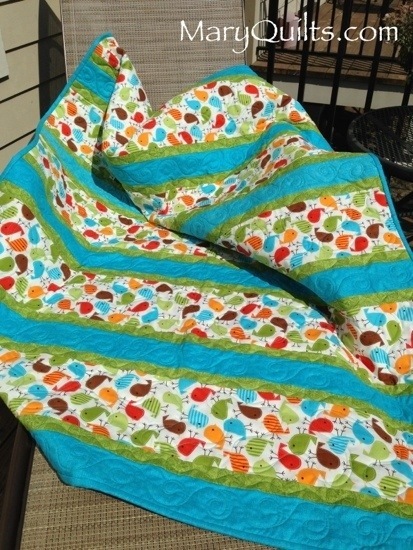 Love this pattern and your quilts are so cheerful! I just love doing strippie quilts. I think they have a “modern” look to them. Thank you for posting. This pattern is just great. We have made so many of these quilts for children of fallen law enforcement officers. We hope it gives them comfort. Thank you again for this pattern. I will be attending a quilt retreat and have 12 kits cut out. The finished quilts will go to those who lost everything this summer in the Lake County CA fires. I know others are making quilts for people in that area. Thank you so much for the pattern. I am about to make my first quilt for my neice’s baby due in November. I think I can do this one. It has so many possiblities for babies! Thanks! Thank you. 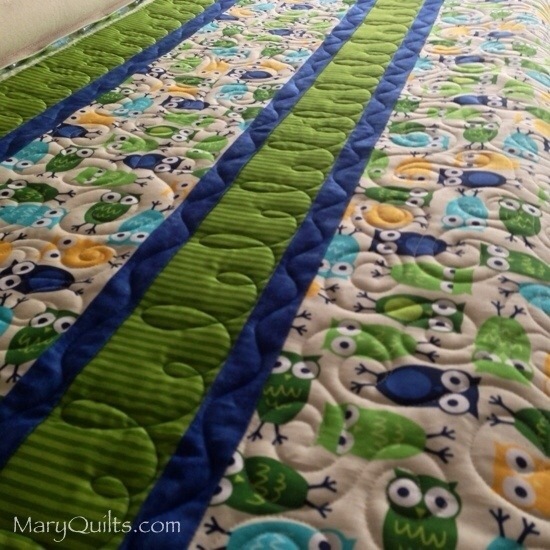 I am in need of a quick baby quilt and this is perfect! Thank you so much for sharing this wonderful quilt pattern!!! I make a lot of donation quilts each year– this year over 30!! I also lead workshops for making donation quilts. This will be a lifesaver!!! Thanks again!!! Thanks so much for this pattern!! This is EXACTLY what I have been looking for for charity quilts! Thanks so much! And thanks for the tips on the width. Wonderful! Thank you so much! I make baby and children’s quilts for charity. (CPC’s) Over the years I’ve made many 100’s and am always looking for new, quick and easy patterns. Thank you for this wonderful pattern. It was recommended on Facebook and I have made 2 so far and I have recommended the pattern to everyone I know.